Oh my Roberts, people! 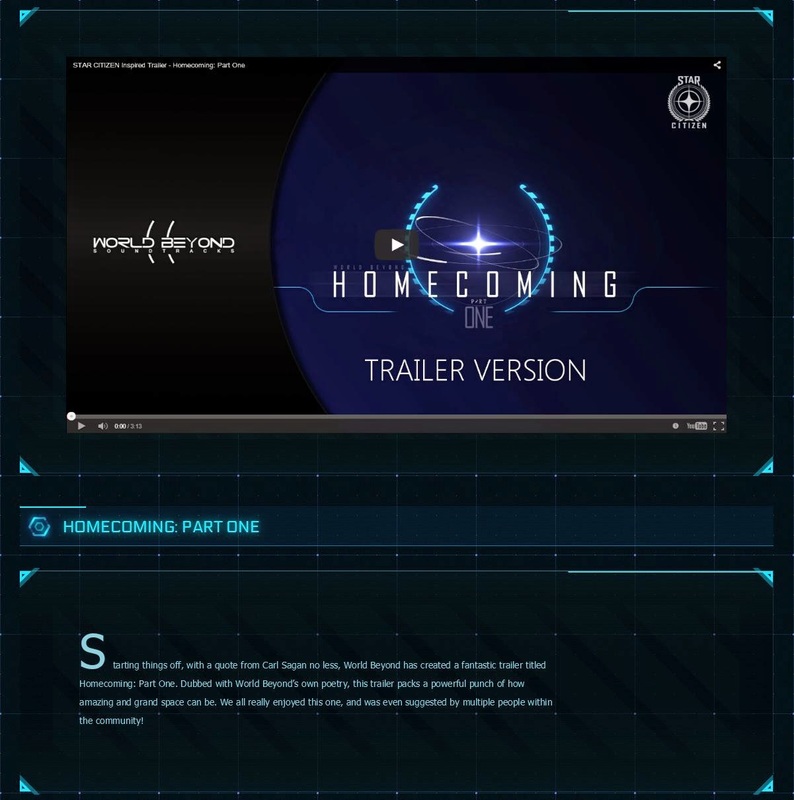 Homecoming: Part One has been featured in the new Fan Spotlight article on the official Star Citizen website among other fan-made trailers. Follow this link to check out the whole showcase. Starting things off, with a quote from Carl Sagan no less, World Beyond has created a fantastic trailer titled Homecoming: Part One. Dubbed with World Beyond’s own poetry, this trailer packs a powerful punch of how amazing and grand space can be. We all really enjoyed this one, and was even suggested by multiple people within the community! Thought in my opinion it would go as more of a fan-produced music piece but this is even more epic! Actually, it was intended to be just a music video to my first Star Citizen dedicated composition, but I always like to take it one step further adding voiceover, or live action, or collaborating. Of all those amazing videos showcased in the article, I have already seen the HertzStudios trailer. In fact, it became my inspiration while I was working on "On the Shoulders of Giants". After that I just couldn't help but write a piece dedicated to Star Citizen and finally made a video matching the words of the poem. So we all actually influence and inspire each other in this amazing community. The story behind Homecoming has been posted earlier on the RSI forums and this website. It kind of explains my special bond with the Chris Roberts' games. Thank you very much, CIG and the community!